Where ever we find the word ” measure”, “large” or “small” in the English Bible our immediate understanding points to size. And when we think of size, we think of volume, capacity and as we continue to analyse, the human brain hits a wall called limitation. Now, the measure of God’s power at work in us is relative to the measure we desire and allow within. Basically, we are saying the level of what we receive is dependant on what we have capacity for. This interpretation is from our human understanding. But when this verse is interpreted in Spirit, it take on a different meaning. 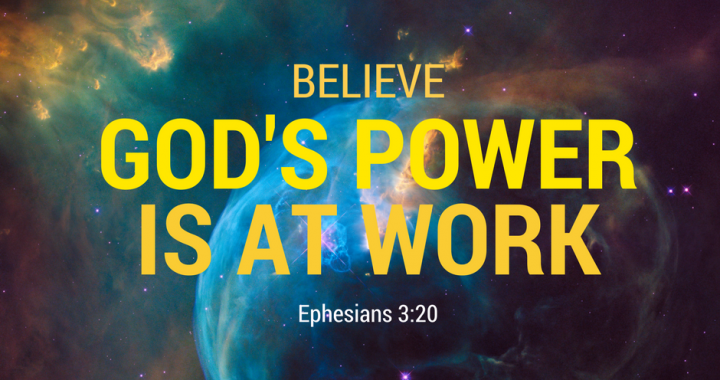 This verse simply states the magnitude of God’s power. This power is immeasurable, it will always exceed what we can ask for or imagine. The greatest revelation is that the same power is in us, ready and waiting to be at work through us. On the day of pentecost the prophecy of John the baptist (Mark 1:8) came to pass, the disciples were baptised with the Holy Spirit. The Holy Spirit is a seal of acceptance from God and through which the Lord reaches us. There are 3 evidence of the baptism of the Holy Spirit – the power, being a witness of God (Acts 1:8) and speaking in tongues (Acts 2:4). When we are filled with the Holy Spirit, we become carriers of Gods power. What we now do with the power is up to us. To prepare for a miracle we must first believe in God’s word, believe that the spirit of God is within us and then learn how to release the power. The more we allow the word of God to permeate our soul and spirit, the stronger our spiritual realities become. Jesus demonstrated the power of the spirit within through the healings and miracles that followed every word He spoke. Miracles are supernatural interventions such as the feeding of the 4,000 and 5,000 people, walking on water, healing the man born blind, turning water into wine, calming the storm and raising the certified dead. Jesus said in John 14:12 – “Very truly I tell you, whoever believes in me will do the works I have been doing, and they will do even greater things than these, because I am going to the Father.” Now, Jesus would not have said this if it were not true. The power of God is at work in you right now, how would you choose to release it? Father of light draw me closer, let me gain understanding of your power that is at work within me. I receive grace to operate the supernatural with the evidence of miracles, signs and wonders. My life is available for the display of your glory. Amen. Posted in All, The Miracle Working God.